I am slowly warming to Nigella Lawson’s books. Hesitant at first (all the recipes I tried were a complete disaster, especially her pistachio macaroons), I am now getting used to her patronizing tone and lengthy explanations. « How to be a domestic goddess » may now become one of my favorite cookbooks. 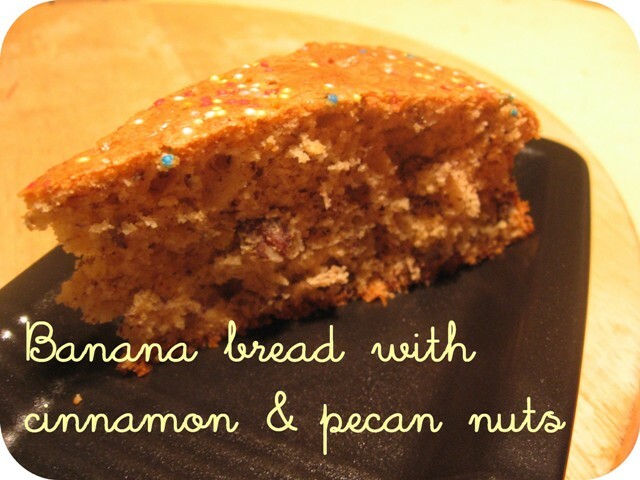 This recipe for banana bread is one I wanted to try for quite a while but somehow didn’t end up baking by lack of time. I’m glad I now did! This « bread » bursts with flavour and remains quite light. I just added some cinnamon and pecan nuts to the original recipe. 1/2 teaspoon cinnamon (or more). Preheat the oven to 325°F. Put the flour, baking powder, baking soda and salt in a medium-sized bowl and, using your hands or a wooden spoon, combine well. In a large bowl, mix the melted butter, cinnamon and sugar and beat until blended. Beat in the eggs, one at a time, then the mashed bananas. Then, with your wooden spoon, stir in the nuts and vanilla extract. Add the flour mixture, a third at a time, stirring well after each bit. Scrape into the loaf pan and bake in the middle of the oven for 1 – 1 1/4 hours. When it’s ready, an inserted toothpick or fine skewer should come out cleanish. Leave in the pan on a rack to cool. You could easily add chocolate chips (or even replace 2 tablespoons of the flour with unsweetened cocoa powder) or raisins.